The Shoals of Ammoron is a work of political and pseudo-historical fiction penned by author Alex Hansen. In a fictionalized ancient civilisation, similar to those of the Greeks or Romans, we find ourselves witnessing a major crisis. The fair and balanced Judge Pahoran, who has ruled his lands well among a council of his peers, is pushed out of office by a bloodthirsty monarch who seeks to conquer a warring country nearby. Pahoran must regretfully enlist the services of Moroni, a military commander, to regain control and save his country. But Moroni is a savage and dangerous fighter, filled as much with venom as he is with charm, and this unlikely pairing might either spell salvation or disaster. Alex Hansen has created a familiar world in the capital of Zarahemla, not too distant from real history but also refreshingly different in some of its practices and policies. The political message of the work is certainly comparable and relatable to modern day struggles and conflicts, but the brutality of basic combat and the time of physical heroics make for an interesting, genuinely life or death atmosphere on every page. None of the central characters is especially likeable, viewed more as a players in the wider picture of events, but central warrior Moroni does steal the eye as we wonder constantly what the reckless and mercurial figure will do next. Fans of historical war stories and modern day political thrillers are sure to find an exciting new genre in Hansen’s work, and I’d definitely recommend The Shoals of Ammoron to them. The Shoals of Ammoron by Alex Hansen is a tightly plotted, beautifully written fantasy with exceptional characters. The city of Zarahemla is quickly falling into chaos after the overthrow and exile of the powerful symbol of its power and unity by a vicious power monger. Exiled from his own home, Chief Judge Pahoran continues to worry about the welfare of his people. While the power of the usurper grows by day, the communities at the southern borders are at the mercy of invaders and Pahoran fears that the self-proclaimed king is about to sacrifice everything to protect his power. There is only one hope of redemption — the support of the skilled military commander called Moroni. Together, can they face the raw challenges ahead and save their city? Alex Hansen’s novel is highly imaginative with a setting that is beautifully imagined and each of its elements skillfully laid out, allowing readers vivid images of places and plunging them in a culture that succinctly portrays the soul of a suffering people. The writing is fluid, punctuated by beautiful descriptions. The scenes are well written, with the point of view coming out clearly in each of them. While the storytelling craft is highly successful, what caught my attention most is the author’s handling of character development. The characters are real and readers can feel their pain. The bold premise establishes the elements that nurture the conflict and character development revolves around the strong conflict. The Shoals of Ammoron is an engaging narrative offering great entertainment for fans of epic fantasy. The Shoals of Ammoron by Alex Hansen is an epic fantasy story. Zarahemla has a new king, self-declared after democratic rule was overthrown. The chief judge, Pahoran, has been sent into exile by the king, a king who is beginning to make his influence and his power known throughout the region. The Southern borders are already under threat of invasion and Judge Pahoran is fearful that the king will do anything to ensure he stays safe in the capital, even to the point of sacrificing the borders. All he can do is try to get a government together that can protect the people from brutal slaughter, and his only hope lies with Moroni, a military commander with a vicious nature. Will Pahoran be successful? The Shoals of Ammoron by Alex Hansen makes for compelling reading. Pulling a reader into the story headfirst from the start, the story takes us on a rollercoaster ride of good and evil. The descriptive nature of the writing makes you feel like you are there fighting the battles, both physical and figurative, as the main protagonist strives to save his fellow countrymen. The characters were developed naturally over the course of the story, each one growing and becoming more real as the book wore on. It’s a fast-paced story with some violence but nothing out of context for the plot. This isn’t usually a genre that I read but I may change my mind about that now - this story certainly gripped me from the first and had me until the very last page. Set against the backdrop of an ancient civilization, The Shoals of Ammoron by Alex Hansen is a compelling fantasy read that throws light on dictatorship, war, monarchy, and power struggles that existed during olden times. There is a lot of chaos happening in the capital city of Zarahemla. Chief Judge Pahoran, the highest political official of the Nephite nation, has inherited his position from his father, making him a king-like ruler. He is ousted from his position and King Pachus has taken over as the leader of the Nephite kingdom. Though Pahoran escapes to Gideon with his family, he is worried about the people of Zarahemla. He decides to enlist the aid of Commander Moroni, a larger than life hero who is known for his valor and bravery, to help the people of Zarahemla and save the city from destruction. Will they be able to save the city of Zarahemla and its people? This novel is spellbinding and will grip readers till the very end, keen to know what is going to happen next. The plot is clear and crisp and there is a good structure to the story. The writing style is fluid and confident and that makes the narration cohesive and gives good movement to the plot. The characters are well sketched and though the story borders on the historical theme, the author’s clever storytelling skills make the tale very interesting. Whether it is Moroni or Pahoran or the other Chief Captains, or the Lamanites, the author draws a visible line demarcating their characters from each other and in that way making them memorable to readers. In The Shoals of Ammoron by Alex Hansen, the Nephites of the north and the Lamanites from the south have been at war for centuries. Under the leadership of King Ammoron, several Nephite cities have been taken. To make things worse, the Nephites' internal conflict threatens to tip the balance of the war in favor of their enemy. 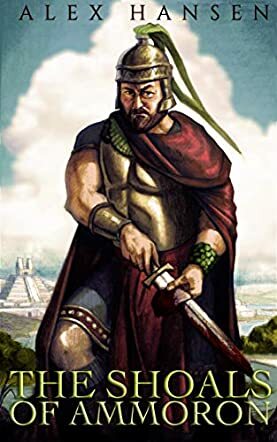 Chief Judge Pahoran, the highest political official of the Nephite city of Zarahemla, is usurped by King Pachus, who’s determined to reinstate the rule of the monarchy in the nation. Forced into exile, Pahoran has no choice but to seek aid from Commander Moroni, the much idolized but volatile military hero of the Nephites. The world-building of The Shoals of Ammoron is detailed and intricate with its geography, demographics, and history. The characters are well fleshed out and the internal political conflicts of the Nephites give great depth to the story line and make it exceptionally credible. Combined with the clean, evocative prose and straightforward but captivating narrative, it was easy for me to immerse myself into the story. It’s interesting to see the self-proclaimed God’s warrior Moroni from the perspective of the principled and dedicated Pahoran, the young, ambitious but capable Captain Limnihah, and the formidable but wise Chief Captain Teancum. Is Pahoran making the right choice by asking Moroni for help? Will Limnihah heed Teancum’s advice and accept that Moroni is not quite the hero that he imagined him to be? Is the uncompromising Moroni going to be the savior once more or the bane of his own people this time? Hansen’s The Shoals of Ammoron is a solid fiction that anyone can enjoy.